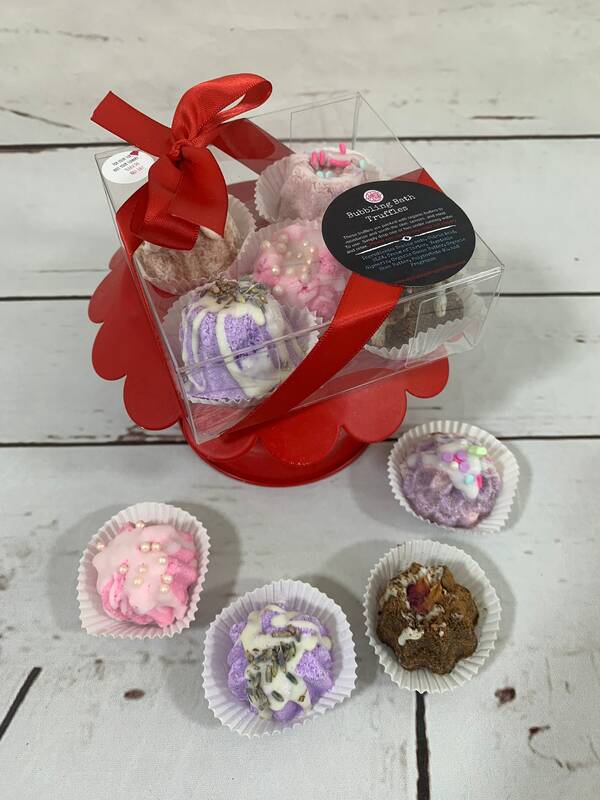 These cute Bath Truffles are ready for gift giving! Also, one of my favorite products to use! Bath truffles are small but pack a mighty moisturizing experience. They gently fizz and soften your bath water with Organic Cocoa Butter and Shea butter. This 5 pack/2 pack will be a random variety pack. You will get a mix of truffles (Lavender, Blushed Cocoa (has real Organic Cocoa Powder), Cashmere Gold, Lick Me All Over, Strawberries and Champagne). You may get 2 of 1 scent. **Please keep in mind some of these fragrances contain vanilla and it does create browning, this does not ruin the quality of the product. I prefer not to add preservatives to my products to prevent browning, I like to keep my products as natural as possible. They still look amazing and smell delicious! Listing is for 5/2 truffles packaged in a cute clear box.